Employers spent more money on Internet recruitment advertising than in newspapers in 2006, making this the first time any of the traditional newspaper categories has been surpassed by the digital media. The aggregate $5.9 billion expected to be spent this year at Monster, Hot Jobs, Craig’s List and the other online job sites eclipsed the $5.4 billion forecast for newspapers, according to Borrell Associates, an independent market research firm. If it’s any consolation to publishers smarting over the loss of their historic dominance in this highly profitable category, recruitment revenues this year appear to have gained nearly 6% from $5.1 billion in 2005. Unfortunately, the brisk market for employment advertising wasn’t enough to overcome the steady inroads that online job sites have made over print in the last 12 years. Unless something changes, the outlook is for further deterioration of newspaper market share, say the analysts at Borrell. The drop to second-place status in recruitment advertising is the first time that online advertising expenditures in any of the traditional newspaper categories – retail, national, recruitment, real estate and auto – have overtaken the amount spent on print. Recruitment advertising was the largest of the three classified categories in 2005, accounting for 10.8% of the $47.4 billion in print newspaper revenues, according to the Newspaper Association of America, the industry’s trade group. The industry notched $2 bllion in online sales in 2005. 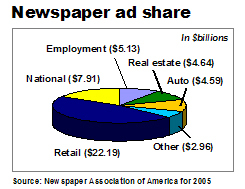 The relative importance of the top newspaper print ad categories is illustrated in the chart below. All the newspaper revenue sources are under increasing pressure. Retail and national advertising have been constricted, respectively, by such things as the combination of major cellular phone companies and the merger of the largest department store chains. Automotive advertising, which is expected to hit a 10-year low, has been affected by both the financial distress of the three domestic car companies and competition from the online sites that enable consumers to conveniently shop for cars by model, features and price. Real estate advertising could suffer in a prolonged slowdown of the housing market. Online job sites have been undercutting the historic dominance of newspapers in two ways. First, they are beating them on price. A job listing on Craig’s List, the cheapest of them all, costs $75 in San Francisco, $25 in New York and is free in Chicago and most other markets. Newspapers accustomed to charging hundreds of dollars for listings can’t compete with those predatory economics. Second, a growing number of highly targeted sites have outflanked newspapers by becoming the de facto marketplaces for nurses, chemical engineers and even journalists. With ads for everything from accountants to X-ray technicians, newspapers indeed have the broadest array of listings, but they cannot match the depth of offerings possible on sites dedicated to individual professions. As much as the employment advertising business has changed in the last decade, it is likely to morph even further in the years ahead. Borrell believes niche job sites will continue to proliferate, putting pressure on not just newspapers but also on the online mega-sites that have siphoned away so much of the market. It’s also possible that the days of help-wanted advertisements may be numbered, regardless of whether they are rendered in print or pixel. A growing number of online employment sites are encouraging visitors to add their resumes to databases that the sites rent to employers seeking to recruit individuals who are not actively searching for jobs. To the degree employers embrace this approach, which would give them access to a far greater population of potential candidates than the typical want-ad can produce, they will divert their recruitment dollars away from ads and into database subscriptions. When job seekers recognize this is a better way to advance their careers, they will stop reading and responding to traditional help-wanted ads. To compete with the growing trend, newspapers ought to be assembling deep and detailed resume databases as fast as they can. Instead, newspapers to date have attempted to compete with the potentially endangered online Monsters by emulating them. Gannett, Tribune and Knight Ridder, to their credit, invested in Career Builder, and their efforts actually contributed to the online job-site revenues that overtook print. In an extremely tardy bid to catch up with the big boys, a group of smaller publishers just 30 days ago affiliated with Yahoo’s Hot Jobs. These palliative efforts, while better than nothing, essentially enable newspapers to compete with the marketplace that evolved over the last dozen years. Optimizing these belated initiatives, unfortunately, will not necessarily equip publishers to compete effectively with the recruitment market of tomorrow. If publishers want to remain major players in recruitment in the future – and they can’t afford not to be – then they need to get ahead of where they are today. If not, the growing number of resumes filling the Internet may include their own.